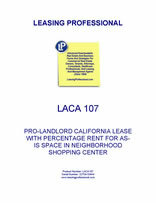 This pro-landlord form is for a California retail tenant taking space in a neighborhood shopping center. The space is being taken by the tenant on an as-is basis, with no improvements required from the landlord. The tenant is obligated to pay percentage rent as well as minimum rent and its proportionate share of operating costs for the center. Several exhibits are included as indicated below. The following is a Summary of certain provisions of the Lease. In the event of any conflict between this Summary and a provision contained in the Lease, the Lease provision shall control. Specific Use of Premises: The Premises shall be used for the operation of a first class retail store selling _____________________________________________ and for no other purpose. Percentage Rent Rate: Five percent (5%) of annual gross sales versus minimum annual rent as defined in the Lease. Break Point: As referenced above. Business to Be Conducted By Tenant: The Premises shall be used for the operation of a first class retail store selling __________________________________________ and for no other purpose. Minimum Hours of Operation: Monday - Friday: 10:00 a.m. - 5:00 p.m. Saturday - Sunday 11:00 a.m. - 5:00 p.m.
Landlord operates the Shopping Center described in the Summary. The legal description of the Shopping Center is set forth in Exhibit A. A depiction of the Shopping Center as it currently exists and is configured is attached as Exhibit B for illustration purposes only but without creating any obligation or liability on the part of Landlord. Tenant desires to lease a portion of the Shopping Center as delineated on Exhibit B ("Premises") on the terms and conditions of this Lease. NOW, THEREFORE, the parties agree as follows. 1. LEASE OF PREMISES; TERM. 1.1 Lease of Premises. Landlord leases to Tenant and Tenant leases from Landlord the Premises. The Premises are agreed to contain the number of square feet set forth in the Summary. Landlord shall not have any liability to Tenant based upon the inaccuracy of such figure. Landlord shall have the right to confirm or to re-measure the Premises and to provide a revised calculation of square footage in the Confirmation Agreement (defined below). 1.2 Lease Term. The Lease Term shall be the number of full calendar months shown in the Summary plus any first partial month, beginning with the Commencement Date and ending on the Expiration Date. 1.3 Commencement Date. Landlord intends to Substantially Complete (as defined below) certain improvements to the Premises described herein as "Landlord's Work", and then to deliver the Premises to Tenant so that Tenant may prepare to open for business after installing its fixtures and other preparations during the Fixturing Period. The "Commencement Date" shall be the earlier of (a) the date Tenant opens for business at the Premises, or (b) the number of days after Substantial Completion of Landlord's Work allowed as the Fixturing Period. If there is no Landlord's Work, then the Premises will be delivered "as is" in their present condition, and the Fixturing Period shall commence upon mutual execution and delivery of this Lease. 1.4 Delays in Substantial Completion. If Landlord fails to Substantially Complete Landlord's Work and deliver possession on or before the Estimated Substantial Completion Date, this Lease shall not be void or terminable by Tenant nor shall Tenant have any claim against Landlord; provided, if Landlord fails to substantially Complete Landlord's Work and deliver possession within 180 days following the Estimated Substantial Completion Date (excluding the periods of any Tenant Delay, as defined below), then either party shall have the right to terminate this Lease by giving written notice to the other within ten (10) days after the end of such 180 day period. Tenant shall have no other rights or claims against Landlord due to late or failed delivery of the Premises. 1.5 Confirmation Agreement. Following the Commencement Date, within ten (10) days of request by Landlord, Tenant shall execute and deliver a Confirmation Agreement prepared by Landlord setting forth the exact Commencement Date and Expiration Date, any adjustment of square footage, any recalculations based on such adjustment, and such other matters related to the commencement of this Lease as may be requested. The format of the Confirmation Agreement is attached hereto as Exhibit D. Failure of Tenant to execute and return such document within ten (10) days shall conclusively be deemed agreement by Tenant to the contents of the proposed Confirmation Agreement. 2.1 Base Rent. Beginning on the Commencement Date and on or before the first day of each month thereafter, Tenant shall pay to Landlord Base Rent in the amount(s) shown in the Summary. Upon execution, Tenant shall pay first month's Base Rent. 2.2.1 Payment of Additional Rent. Beginning upon Substantial Completion of Landlord's Work, Tenant shall be liable for and shall pay its Proportionate Share of Operating Expenses, as defined in this Section 2.2. (o) A reserve for certain expenses, designated by Landlord from time to time, which are incurred less frequently than annually, including but not be limited to the cost of the painting of the exterior of buildings; restriping, resealing, replacing and recoating paved areas of the Shopping Center; and recoating and replacing roofs of buildings. Landlord reserves the right to adjust the reserve contribution annually. The reserve does not bear interest and may be commingled. Upon termination of this Lease, Tenant shall not be entitled to the refund of any amounts paid into the reserve. The listing above shall not impose upon Landlord the obligation to perform any act or make available any service.